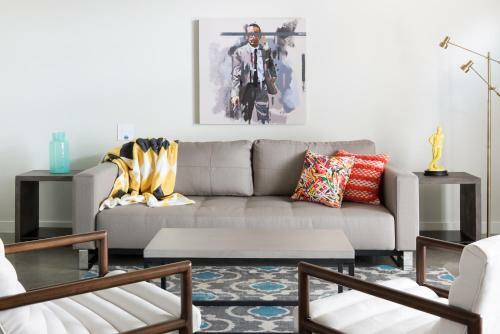 Popular dining options and relaxing digs in downtown Austin are highlights of the comforting treats guests enjoy at the non-smoking Radisson Hotel and Suites Austin Downtown. The 12-story Radisson Hotel and Suites houses 413 non-smoking rooms featuring comfy bedding flat-panel HDTVs with premium channels mp3 docks and free local calls. Wi-Fi is available for a fee. Guests can bask on the sundeck and order treats from the popular on-site restaurant open for breakfast lunch and dinner with a daily lunch buffet. Limited room service is also an option. Get a workout in the fitness room and get things done in the business center. The outdoor saltwater infinity pool is a great place to cool off and the spa is the place to go to relax. Pets are allowed and self- and valet parking are available all for an extra charge. The Radisson is on Cesar Chavez Street and Congress Avenue next to the Lady Bird Lake Trail. Guests can help keep Austin weird by joining the crowd of people watching the bats take off on their sunset hunt for food (mainly insects) from underneath the neighboring Congress Avenue Bridge. 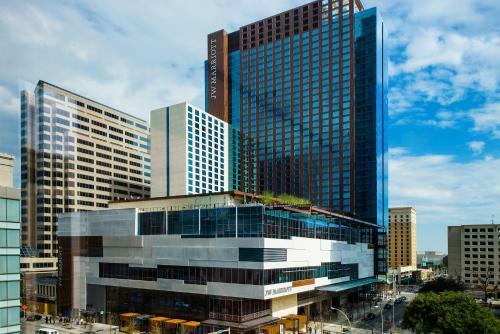 Events at the Austin Convention Center are a convenient three blocks east and the shopping and dining of Second Street buzzes a block from the hotel. Austin-Bergstrom International Airport is just seven miles east.